Antares’ legendary plugin boiled down to just the essentials. The essentials in one plug in. Auto-Tune has long been an essential plugin for any producer working with vocals, but with Auto-Tune Pro priced $399, there are many potential users who simply can’t afford to get on the flagship. Until now, those people have been catered for by the $129 Auto-Tune EFX 3, but now there’s an even more affordable option available in the shape of Auto- Tune Access. This massively cut-down version of Auto-Tune Pro sports even less in the way of controls than EFX 3, but employs the same pack-leading correction algorithm used by all versions of Auto-Tune. 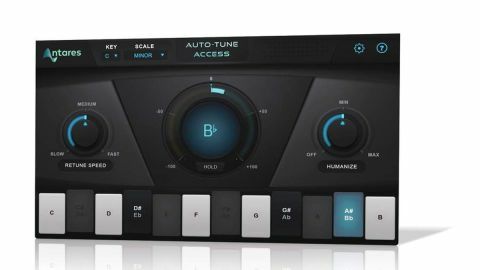 Send a vocal or monophonic instrumental line its way and set the Key and Scale fields to match it, or activate and deactivate notes on the keyboard at the bottom - which light up blue to show the input pitch in real time - to define a custom scale. The plugin then ‘snaps’ the audio to that scale, displaying the output notes and the amount of retuning going on at any given moment (in cents) in the central display. The Retune Speed can be set to Slow (3ms), Medium (25ms) or Fast (65ms), while the Humanize knob has two settings for bringing back vibrato that might be lost in correction: Min and Max. And that’s all there is to it! This is as straightforward as Auto-Tune has ever been - Antares’ legendary plugin boiled down to just the essentials. Although it’s obviously nowhere near as viable for creative manipulation as Auto-Tune Pro, for general correction of wayward singers, it works well and sounds great. It’s also notable for being the only Auto-Tune that doesn’t require an iLok hardware key for authorisation. We have to say, though, that for $30 more, Auto-Tune EFX 3 adds freely adjustable Retune Speed and Humanize parameters, amongst other features. This situation is set to change in the near future with the more expensive next version of EFX, but right now it’s actually the better buy for those who already own an iLok.